This cry from a wounded heart comes at the end of Alfred Hitchcock's “Vertigo,” and by the time it comes we are completely in sympathy. A man has fallen in love with a woman who does not exist, and now he cries out harshly against the real woman who impersonated her. But there is so much more to it than that. The real woman has fallen in love with him. In tricking him, she tricked herself. And the man, by preferring his dream to the woman standing before him, has lost both. Then there is another level, beneath all of the others. Alfred Hitchcock was known as the most controlling of directors, particularly when it came to women. The female characters in his films reflected the same qualities over and over again: They were blond. They were icy and remote. They were imprisoned in costumes that subtly combined fashion with fetishism. They mesmerized the men, who often had physical or psychological handicaps. Sooner or later, every Hitchcock woman was humiliated. All of these emotional threads come together in the greatest single shot in all of Hitchcock. Scottie, a former San Francisco police detective hired by Gavin to follow “Madeleine,” has become obsessed with her. Then it appears Madeleine has died. By chance, Scottie encounters Judy, who looks uncannily like Madeleine, but appears to be a more carnal, less polished version. Of course he does not realize she is exactly the same woman. He asks her out and Judy unwisely accepts. During their strange, stilted courtship, she begins to pity and care for him, so that when he asks her to remake herself into Madeleine, she agrees, playing the same role the second time. The great scene takes place in a hotel room, lit by a neon sign. Judy has arrived, not looking enough like Madeleine to satisfy Scottie, who wants her in the *same* dress, with the *same* hair. His eyes burn with zealous fixation. Judy realizes that Scottie is indifferent to her as a person and sees her as an object. Because she loves him, she accepts this. She locks herself into the bathroom, does the makeover, opens the door and walks toward Scottie out of a haunting green fog that is apparently explained by the neon sign, but is in fact a dreamlike effect. As Hitchcock cuts back and forth between Novak's face (showing such pain, such sorrow, such a will to please) and Stewart's (in a rapture of lust and gratified control), we feel hearts being torn apart: They are both slaves of an image fabricated by a man who is not even in the room--Gavin, who created “Madeleine” as a device to allow himself to get away with the murder of his wife. Alfred Hitchcock took universal emotions, like fear, guilt and lust, placed them in ordinary characters, and developed them in images more than in words. His most frequent character, an innocent man wrongly accused, inspired much deeper identification than the superficial supermen in today's action movies. He was a great visual stylist in two ways: He used obvious images and surrounded them with a subtle context. Consider the obvious ways he suggests James Stewart's vertigo. An opening shot shows him teetering on a ladder, looking down at a street below. Flashbacks show why he left the police force. A bell tower at a mission terrifies him, and Hitchcock creates a famous shot to show his point of view: Using a model of the inside of the tower, and zooming the lens in while at the same time physically pulling the camera back, Hitchcock shows the walls approaching and receding at the same time; the space has the logic of a nightmare. But then notice less obvious ways that the movie sneaks in the concept of falling, as when Scottie drives down San Francisco's hills, but never up. And note how truly he “falls” in love. 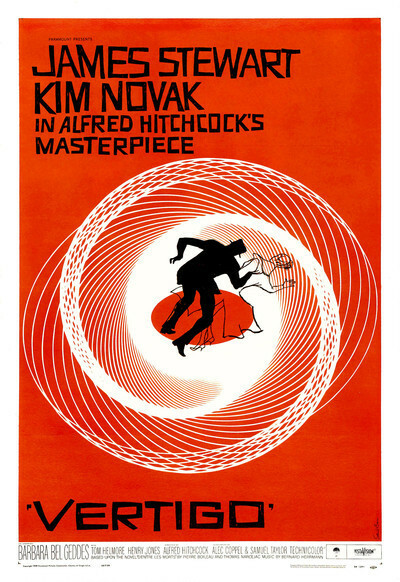 There is another element, rarely commented on, that makes “Vertigo” a great film. From the moment we are let in on the secret, the movie is equally about Judy: her pain, her loss, the trap she's in. Hitchcock so cleverly manipulates the story that when the two characters climb up that mission tower, we identify with both of them, and fear for both of them, and in a way Judy is less guilty than Scottie. The danger is to see Judy, played by Novak, as an object in the same way that Scottie sees her. She is in fact one of the most sympathetic female characters in all of Hitchcock. Over and over in his films, Hitchcock took delight in literally and figuratively dragging his women through the mud--humiliating them, spoiling their hair and clothes as if lashing at his own fetishes. Judy, in “Vertigo,” is the closest he came to sympathizing with the female victims of his plots. And Novak, criticized at the time for playing the character too stiffly, has made the correct acting choices: Ask yourself how you would move and speak if you were in unbearable pain, and then look again at Judy.